Notes on Wooden Boat Kits. These are designed to make boat building an easy and enjoyable experience. Because the price of resin is dependent on the price of oil, solid GRP boats are becoming more expensive. The price of wood on the other hand is relatively stable. So even if using epoxy in the construction, building a Wooden Boat is increasingly becoming a popular way to get afloat. There is a bewildering array of wooden boat kits available from the simplest small boat to the large and complex. You will find something to suit all needs and skill levels. The main advantage for the home builder is that kits eliminate the need to for lofting. All those critical parts are pre-cut ready for assembly. Most suppliers these days use computer controlled routers to cut the sections which, should eliminate any construction problems. What you get with your boat kits does vary. Some wooden boat kits will supply everything needed. Others will usually say what extras you will need to finish with a usable craft. The time needed to build your boat will be greatly reduced by having the work of cutting out done for you. Kit suppliers will often give a building time. However, bear in mind that these times will vary greatly. A first time builder, working on the kitchen table will take considerably longer than a skilled person in a fully equipped workshop. Some of the simplest of designs can and often are among the most beautiful. And the joy and fun of messing about in your own boat will be greatly enhanced by knowing you built her yourself. Building the Ilur dinghy with a new NC cut plywood kit. The two most common Wooden boat kits methods of construction are stitch and glue and strip planking. The simplest kits use the stitch and glue method. These need less skill, are quicker to build and can produce a just as strong a boat as traditions methods. However, stitch and glue can vary in complexity, from the very simple hard chine boats to quite complex multi-chine and lapstrake. Some of the simplest require only four pieces to be glued together. Just because they are simple to build doesn't mean that they are not good to look at. All methods have their advantages and disadvantages. However, for a truly beautiful boat, strip planking is for many the way to go. Strip planking will however mean a lot more pieces and a lot more joints to glue. Although it may not be the quickest method the individual steps are not difficult. And it does allow for a lot of individual creativity. There will however, be a lot more finishing to do. All those strips will need faring to give a smooth hull. Some kits will include spars masts and the like. However, it is important to check. All the extras can greatly increase the cost of getting you project on the water. Here are a couple of blogs from home builders of kit boats. My first real experience of boating on my own was as a young teenager in a canvas on frame canoe. I can still remember being lost in the moment, the feeling of serenity and peace as I slid among the shallows looking out for fish and bird life. It was only a small lake, or I should say lough as it was in Ireland and only half a mile from home and there was a road running around three sides but for me in my canoe it was the Atlantic, the North West Frontier, it was heaven. My last canoe experience was on a beautiful sea lough on the west coast of Scotland, with three friends. And though the years may have dulled my imagination that was an equally magical experience. My first experience was in what is usually called a canoe the latter in what is referred to as a kayak. Quite where the distinction between kayak and canoe lies is rather blurred. Basically there are 3 types of canoe. The Kayak which has a closed cockpit and the paddler uses a double ended paddle. The open canoe which includes the American Indians style which is normally larger than a kayak and where the paddler kneels using a single bladed paddle. The touring Canoe which is similar to the kayak but which tends to be less streamlined, beamer, more stable and more open. At least that is the basic distinction as I see it however, there are hundreds of different designs to suit different conditions and uses. Before rushing into choosing a canoe it's vital you know what to look for. Joining a canoeing club will give you the perfect opportunity to try before you buy a wooden boat kit, usually they will allow you to borrow the essentials such as the boat, paddles and safety gear. Apart from being a magical experience canoeing is a great water sport which will keep your body fit and healthy. Anyone new to kayaking who is thinking of building their own, would do well to join a club. This will not only allow you to borrow the essentials such as the boat, paddles and try out the sport but talk to experienced kayakers and decide which style of boat to go for. There is a huge choice of plans and wooden boat kits available, to suit all levels of both kayaking and woodworking skills. However, building your own boat is wonderfully rewarding, especially when someone compliments you on your creation. And what better way to spend those dark, cold winter evenings. 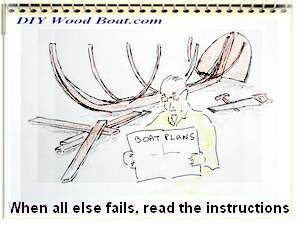 Plus, building your own wooden boat kit will cost a fraction of the price of a ready built model. There are three main types of home building methods. Most of them can be made with common hand tools, though some power tools will make your work a lot easier. The cost will depend on whether you buy a complete kit, or you choose to buy a set of plans and buy the materials yourself. Don't forget to allow for essential gear such as paddles and buoyancy aids. You might also want to equip yourself with a wetsuit, neoprene shoes and perhaps a trailer or roof rack. And, if you are considering touring in your kayak a spray skirt, bilge pump, spare paddle, compass, VHF radio, navigation charts and camping supplies are among the host of other items you will need. Time, if you want a boat that is seaworthy and one to be proud of don't rush. Space, you will need plenty of room so you can work all round her and good ventilation for when using epoxies, paint or varnish. And don't forget about getting her out when she is fully built. The time and effort you put into building your own kayak will be well worth the effort when you step into her, push away from land, take that first stroke and float free. 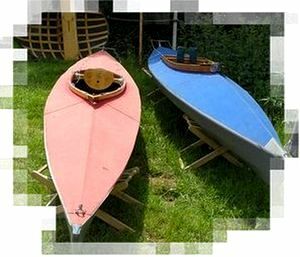 Wooden boat kits for Rowing are also available in wide variety of designs. There are also many Free Plans available on line. A good Finish on your wooden boat kit will make it a pleasure to the eye. It will also help to preserve the underlying wood structure, thus prolonging the life of your wooden boat kits. The secret to a good finish lies in the priming. The primer helps to seal and fill the surface. It also provides an even color base and a binder for the top coat. What Paint to use and how to get a good finish. The majority of these wooden boat kits do not require any specialist tools. Common DIY hand tools such as a drill, perhaps a saw, a pair of pliers, and a paint roller for the epoxy. You may not need them but a good selection of clamps will be very useful. There are several boat building clamps which the average handy-person can make from spare timber. I thought I'd find a kit to build, click on it and have it sent to me. The information here is very useful though.